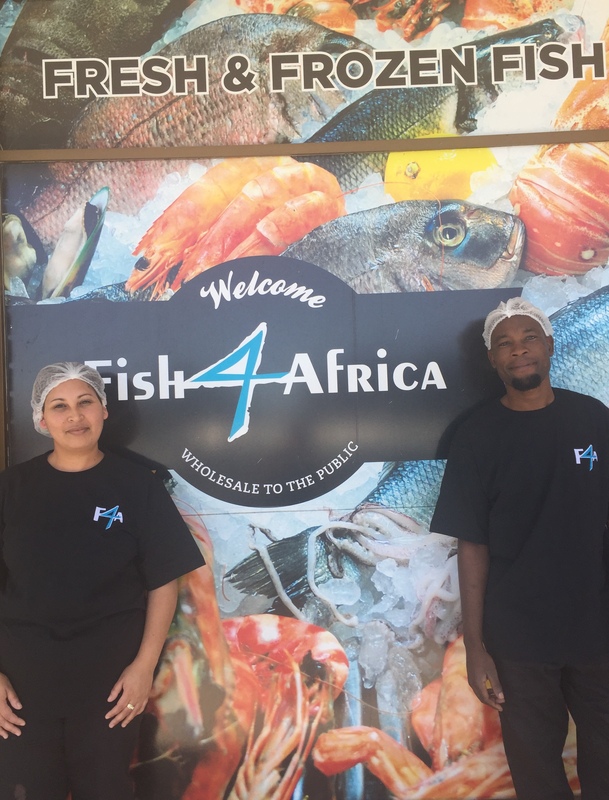 Stan and Trumilda both work at the Fish4Africa Monte Vista store. Get to know them on a more personal level by understanding how they got into the fishing industry and why they are passionate about their work. What is your role at Fish4Africa? How did you get into commercial fishing? S: A friend referred me and introduced me into the industry. S: I enjoy arranging the fish on the display window. T: I like to interact with the customers. What is your favourite fish and why? S: Definitely hake. It’s easy to fillet. What do you think is the best way to cook fish? T: Steam – very healthy. 6. What is your favourite fish dish? S: Praying and spending time with God. Why do you think fish is an important food source? T: It’s healthy. Very good for the brain and you get different kinds of vitamins. What do you get asked most by customers? S: Whether our fish is fresh. T: Is the fish fresh? S: When a customer is happy. T: When a customer says thank you for a good service. 11. Why do you think Fish4Africa is a leading fish and seafood supplier? S: Our fish is always fresh and there’s a great selection.